If you’re catching up, here are parts one and two. So, the big day! I woke up around 7am and actually had a fairly relaxed morning. 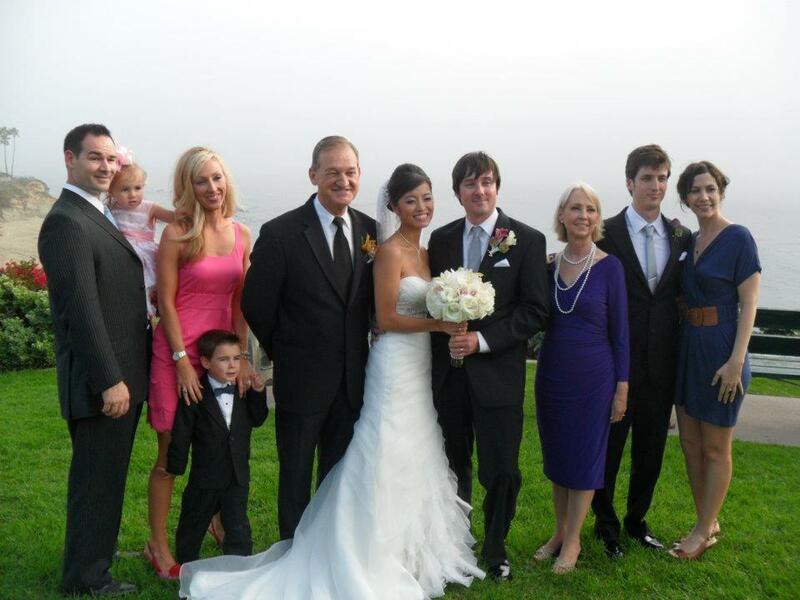 We had plenty of time to eat breakfast and get ready before the limo picked us up at 10:00. First, let me back up a little. 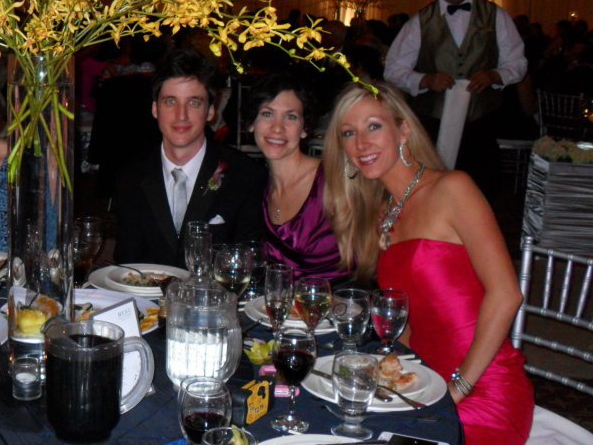 Matt and Suzanne wanted to spend the night before their wedding apart, so he stayed with us. The house we stayed in was cool, but a little weird, and included Disney Princess bedroom. So of course that’s where we had Matt sleep! Only the best for the groom. His last night of bachelorhood, and he slept in a pink canopy bed in a room with Disney princesses on the walls. Perfection. 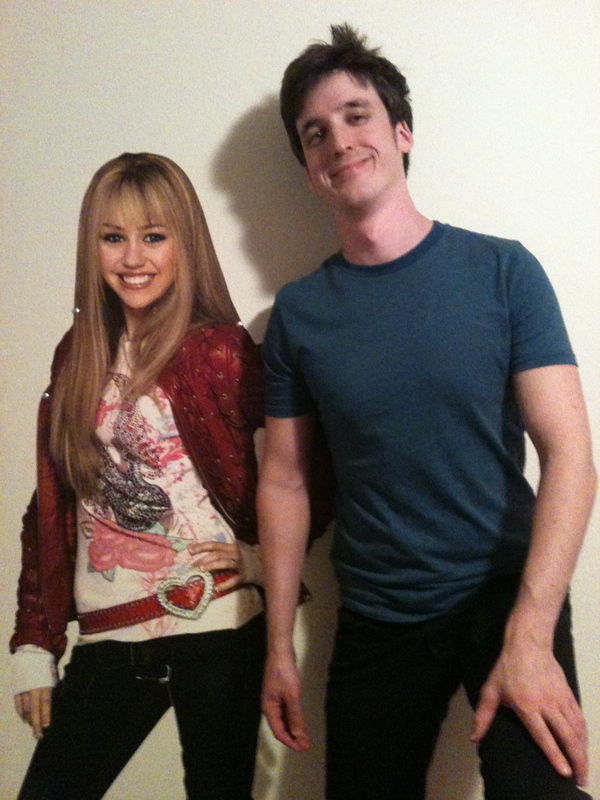 I don’t have any pics of Matt in the room, but here is one of Eric getting up close and personal with a Hannah Montana decal on the wall. where is Chris Hanson when you need him? Anyhoo – back to the wedding morning preparations. 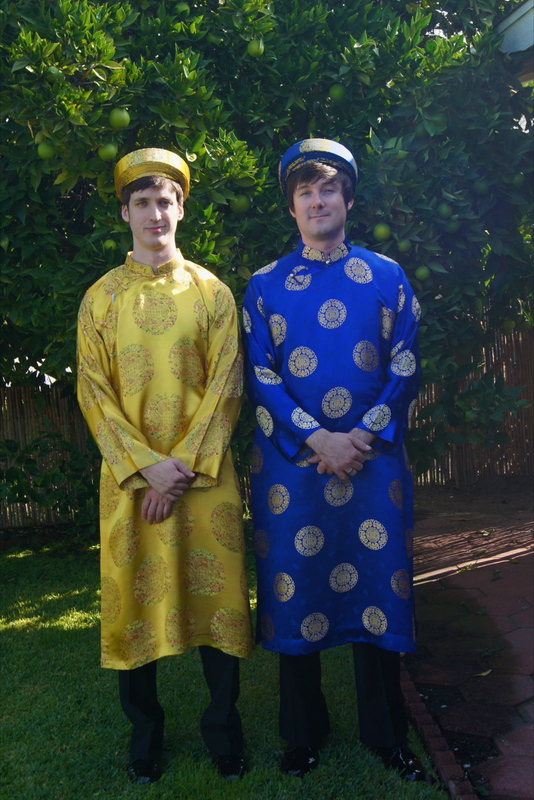 While the rest of the family got ready, Eric and Matt went to the Asian district to pick up an entire smoke pig (head and all) for the Vietnamese ceremony. We all got in our ào daí and headed out. Let me tell you, we got more than a few stares from the neighbors as we walked to the limo. 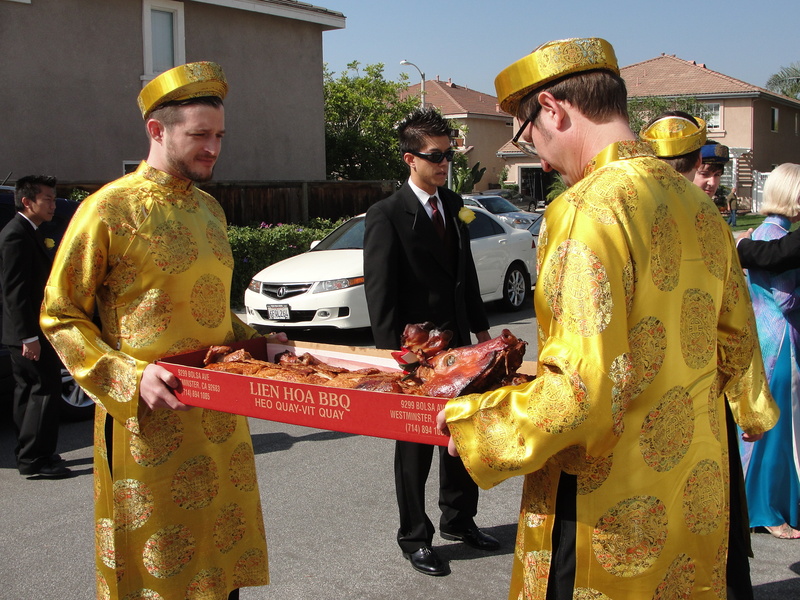 I don’t know what they found so strange about a bunch of white people dressed in traditional Vietnamese costumes carrying a dead pig to a limo. Weirdos. We got to Suzanne’s parent’s neighborhood for the traditional procession of the groom’s family and groomsmen to the bride’s family home. It was quite funny between all of the neighbors watching, the bride’s side staring, and a bajillion cameras taking our pictures. I’m sure there is more than one picture of me looking completely awkward and confused from that day. 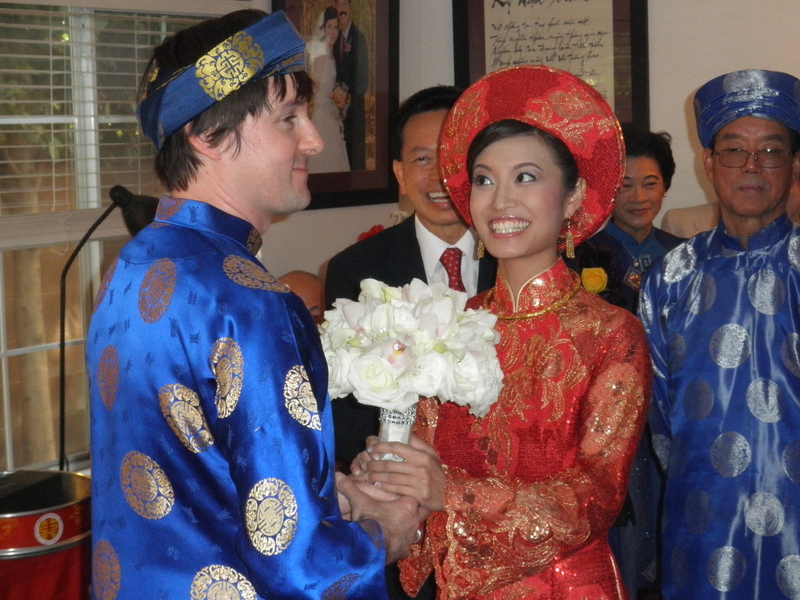 The ceremony itself was really interesting and sweet. They had a Buddhist monk chant (which I loved!) 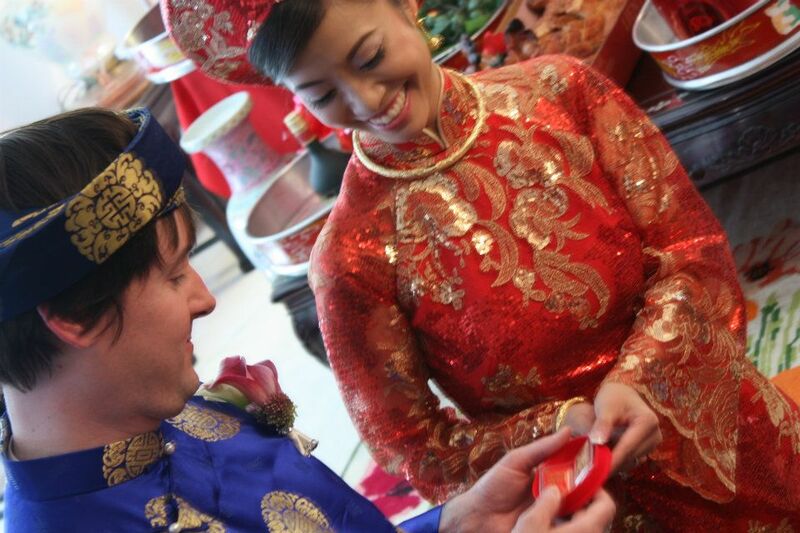 and give advice to the couple, and then they had the tea ceremony, which is where they approach both sets of parents, give their thanks (and tea) to the parents and receive advice (and gifts) from them. Everything was colorful and heartfelt. After the ceremony and a lunch, we headed to the beach for the Western ceremony. Eric, Matt, their parents and I rode together while Suzanne and the bridesmaids took the limo. We were supposed to arrive first so that when Suzanne arrived Matt would already be in place, but we all hit crazy traffic. There was a bad accident and we all ended up arriving 45 minutes late. Everyone seemed to take it in stride, though, and the ceremony was well worth the wait. It.was.beautiful. A fog rolled in (it was freezing!) and the overcast background, while obscuring the ocean view, made for some cool photos. I loved all of the little touches. 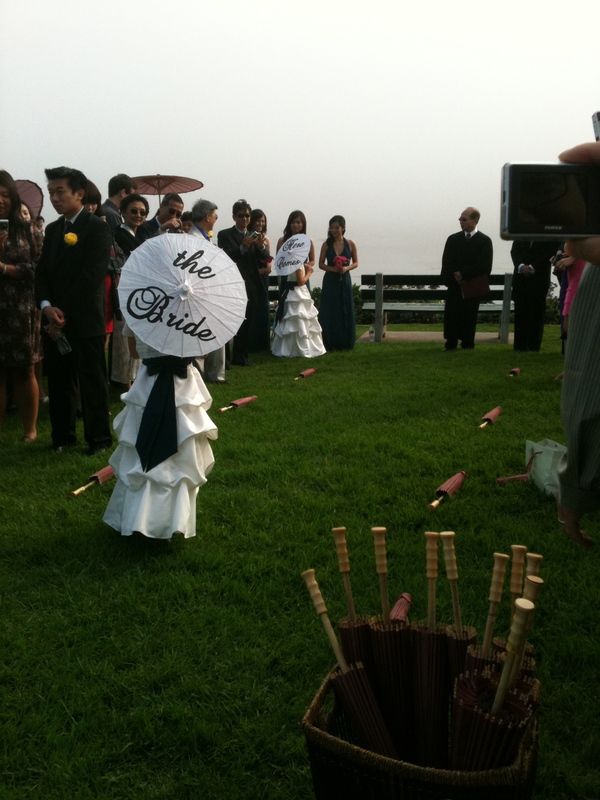 adorable flower girls carried umbrellas that said "Here Comes" "the Bride"
she actually rented that dress. can you believe it? 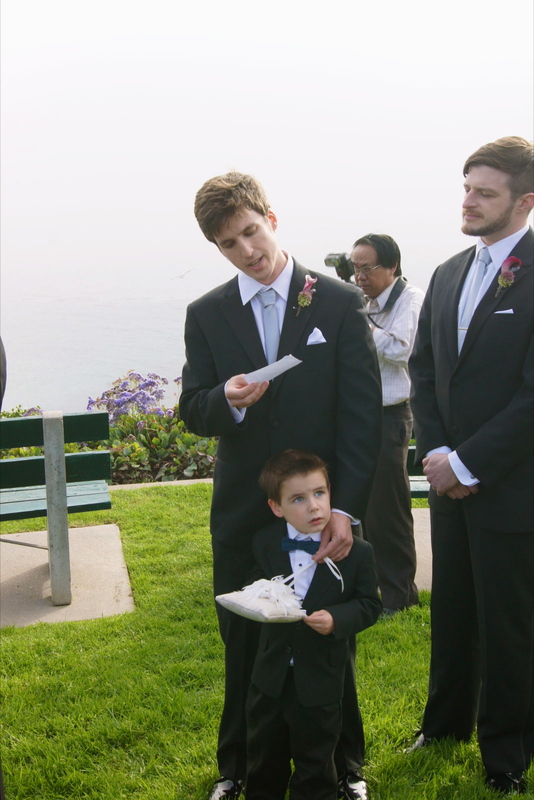 And, I have to say, Eric looked quite smashing in his tux (and Cooper was adorable as the ring bearer). 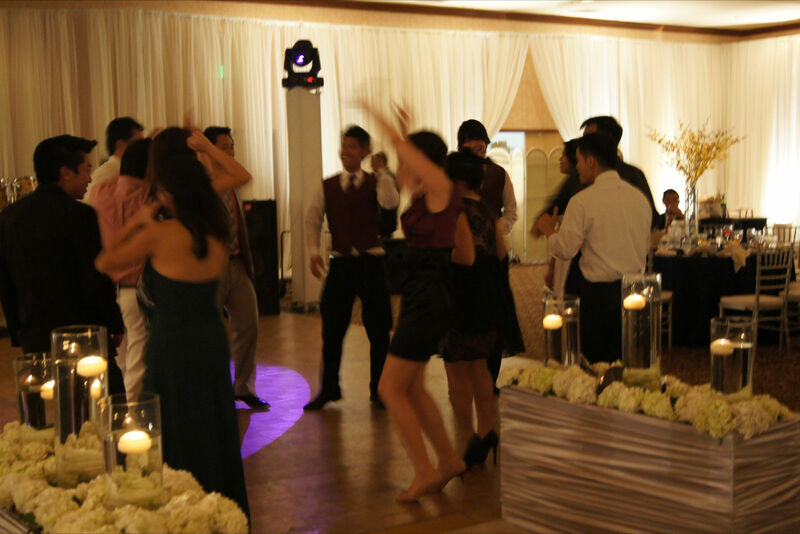 … we headed back to the house to change and get ready for the über fancy reception at the Plaza! The reception hall was gorgeous. The walls were draped in chiffon, there were exotic flowers and candles everywhere, and a stage, dance floor, and red carpet! let the eating, I mean partying, begin! 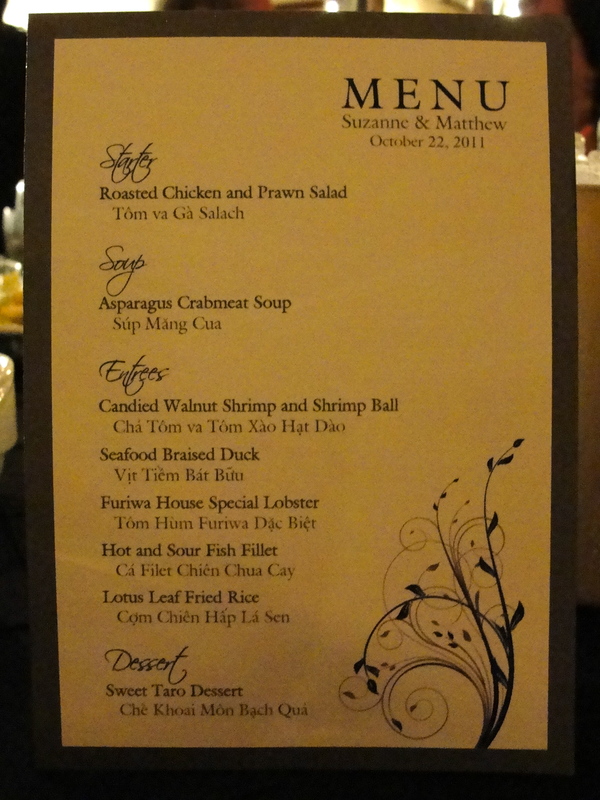 Not to mention an open bar and 10 course meal. 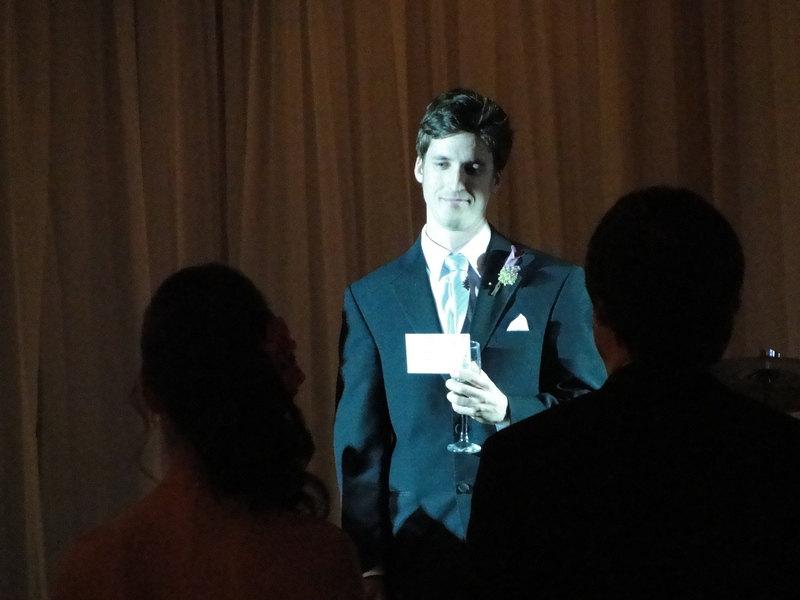 Of course, as the best man, Eric gave a toast. I have to say, I was so proud of him! He is a naturally really funny guy, but speeches are not his favorite thing … and to give a speech on stage in front of nearly 400 people? Yikes! But he prepared one of the funniest and most touching best man speeches I have ever heard (honestly and for realsies – I am not being biased here! ), and he seemed completely at ease. His opening line cracked me up: “Okay, let’s get this roast started! Matt, are you ready?” He got a lot of good laughs, as well as a few “awwwws,” and I could tell Matt and Suzanne really enjoyed it, too. Okay, okay, I will stop bragging now. Another highlight of the night was a video made by Suzanne’s brother Victor. He interviewed them separately a few months before the wedding, and then spliced it together with some text, photos of their time together, and music. The interviews were hilarious, and the whole video was well done. 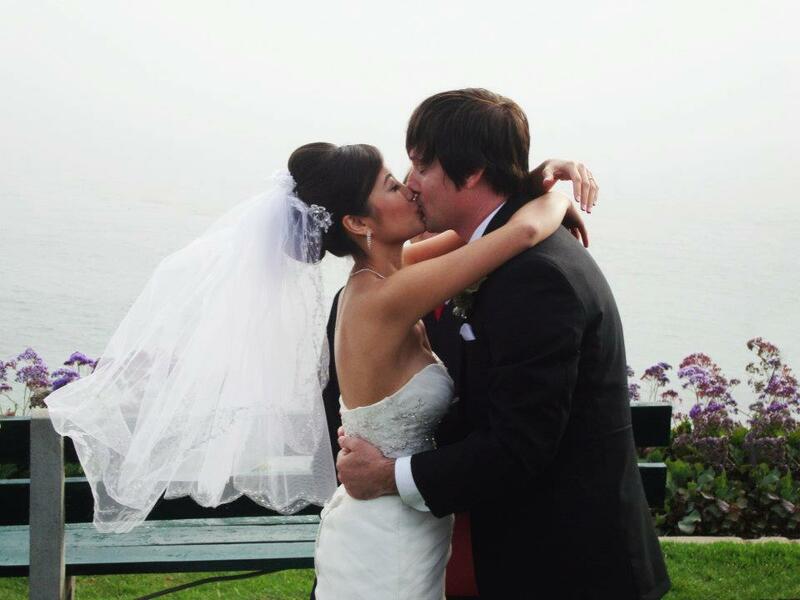 Matt and Suzanne have been together for 11 years, so seeing their story unfold on screen like that was really special. Linsey and I also enjoyed the chocolate covered strawberries (that came in those boxes we made a few nights before). I had so much fun on this trip, and one of the best parts was getting such great bonding time with Linsey and the rest of the family. Eric and I have been together over 7 years, and his family embraced me right from the beginning, but this trip made me really feel like a part of the family. Love them! Around midnight, most people started clearing out. But not us! We stayed for the after party. 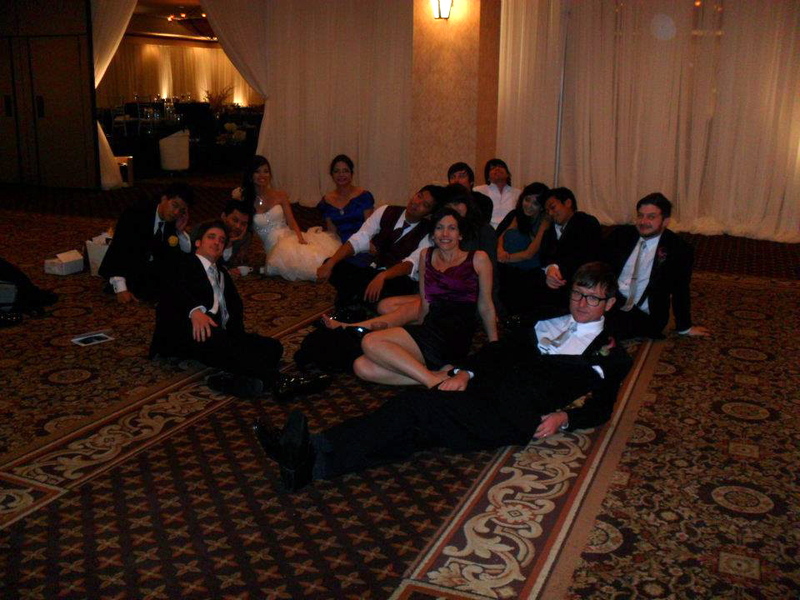 Well, the after party that was really like the totally exhausted sprawling out on the floor party. 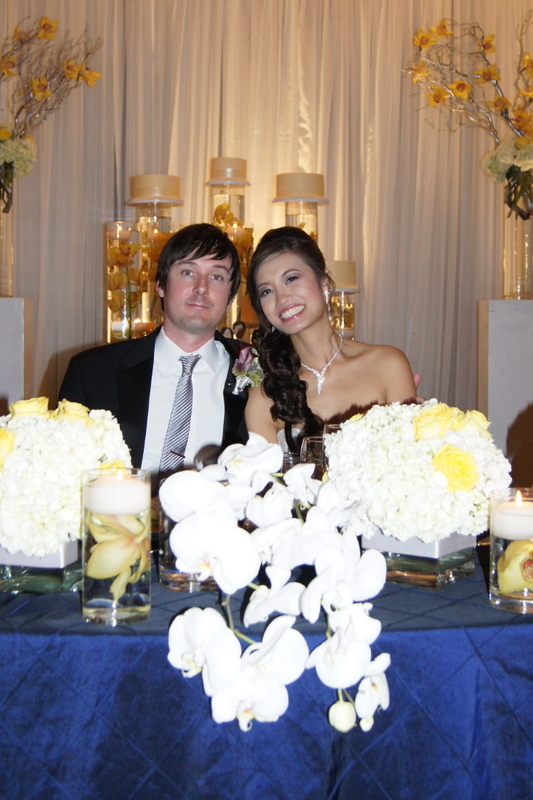 It was definitely one of the craziest, prettiest, and fanciest weddings I have ever been to! Eric and I finally called it a night morning around 2:30am. It’s a good thing, too, because the next day was DISNEYLAND!! !